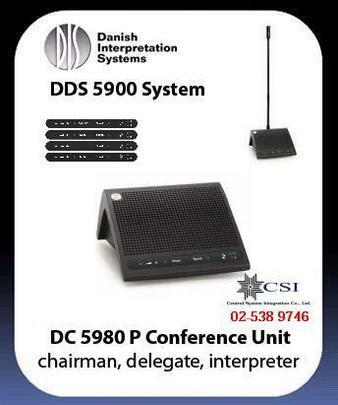 DDS 5900 Digital Discussion System product portfolio. The unit can be configured either as a chairman, delegate or interpreter unit. As default the unit is configured as a delegate unit but the button overlay is exchangeable to match the functionality. Reconfiguration is easily done by activating a combination of buttons for 10 seconds for switching between chairman, delegate or interpreter configuration. When the units is configured the LED's start flashing and the unit will reboot. The configuration is stored in the unit and it keeps the configuration even if it is used in another DDS 5900 system. Depending on the configuration the left button changes functionality. Chairman configuration support "Del. Off' that allows the chairman to switch off all active delegate microphones. The delegate and interpreter configuration supports 'Mute' functionality that allows the user to temporarily mute his/her active microphone while the mute button is pressed down. The delegate configuration can also be changed to omit the 'Mute' functionality so the delegate only has a 'Speak' button. The 'Speak' button enables the user to activate/deactivate the microphone. The floor channel is distributed through the built-in loudspeaker except when the microphone is active. By connecting a headphone the user can listen to the floor channel or one of the 2 interpretation channels. Headphone volume can be adjusted with the volume buttons. Interpreters will always listen to the floor channel in the headphone and can select the outgoing channel for interpretation. A gooseneck microphone (GM 59xx or GM 6xxx) can be inserted in the lockable XLR socket. The lock is accessible from a small hole beside the XLR socket with a 1.5 mm hex key. Turning the hex key counter clockwise locks the gooseneck microphone and turning the hex key clockwise unlocks the gooseneck microphone from the unit. "Sometimes less is all you need"